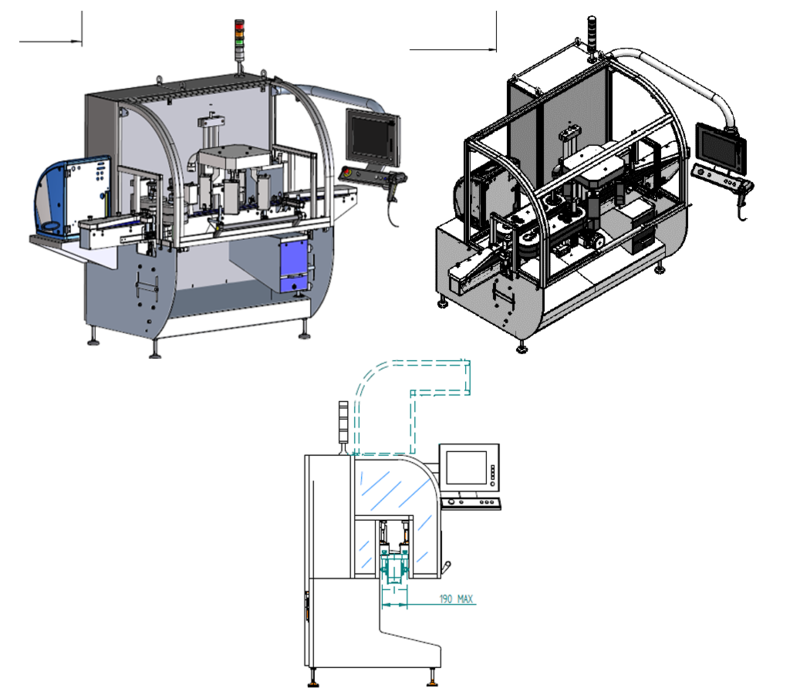 Bottle Serialization Modules - Xyntek Inc. Bottle Tracking System (BTS) is the complete hardware and software solution to fulfill the current and upcoming regulations on traceability and e-pedigree when bottles have to be managed as a single selling unit. A real-time device manages all data, from serialization to the construction of the parent/child relations at different packaging levels, assuring data security in any condition. 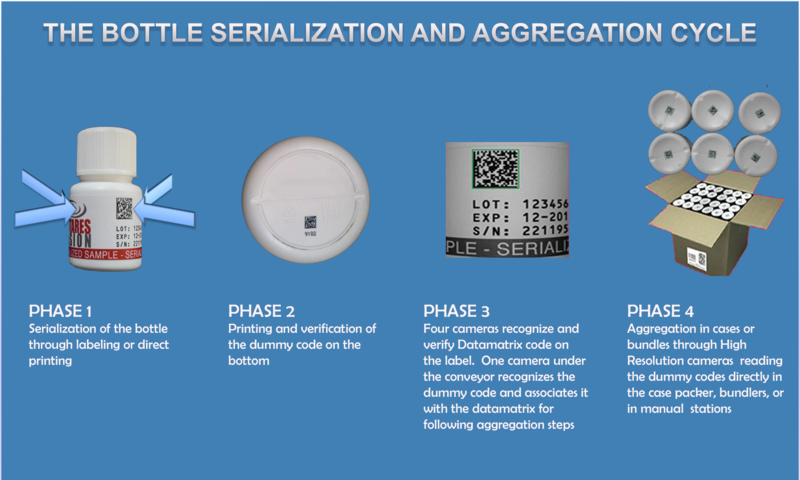 Moreover, the dedicated Antares Code Association Software is specifically designed to associate the serialized Datamatrix on the label with the “dummy code” printed on the bottom. All modules and components are integrated in the ATS-Antares Tracking System architecture for the total management of Track&Trace at line, plant, warehouse, and corporate level. Other controls such as OCR/OCV, lot and expiry date, logo and printing correctness, may also be performed in this phase (using the Antares Universal Packaging Inspector suite). 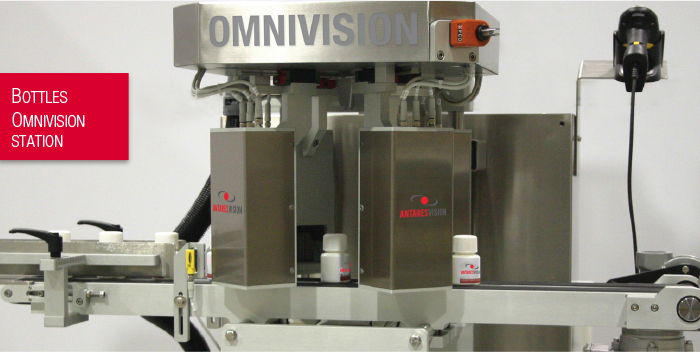 The core of the system is the OMNIVISION, a special version of Antares serialization modules, that is able to print a serialized “dummy code” underneath the bottle and associate it to the true serial code. 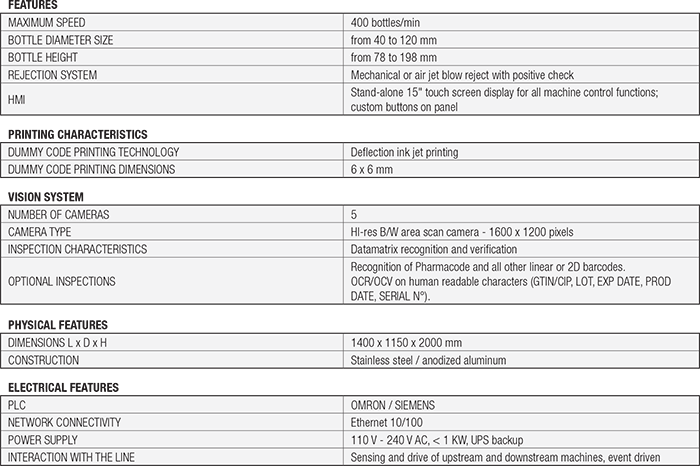 The following levels of aggregation on bundle and/or case are controlled by high resolution area scan or linescan cameras that can be integrated directly inside the packaging machines or packaging robotics. 4 cameras positioned 90 degrees apart recognize the 2D code on the unoriented bottle by capturing 4 individual images of the bottle as it passes through the inspection module. A camera positioned under the conveyor reads and recognizes the dummy code, by grabbing an image at the same time as the other four cameras. Associates the “dummy code” with the true 2D code, allowing for the next bottle to bundle or bottle to case aggregation process. Non conforming bottles are rejected by a air-blow/ mechanical system.